Well I posted a question if there were any long wire gurus on the GQRP list a while back to see if anyone else might recommend an alternative for my home qth. The issue is I seem to have a problem working sub 300 mile qso on 40m and 80m as I usually use a vertical on both bands as I have some interesting antenna restrictions. The first is not really a restriction but I have agreed a 'no wires across the garden' rule which means that a permanent dipole (I have a 150-166 foot garden) is definitely out as I can neither put in a central support or have traps, balun, choke or ladder line in view. The reasons are multiple but the big one is neighbours. We are close to RAF Duxford (home of GB2IWM) and when the spitfires are flying ANYTHING and I mean absolutely ANYTHING is spotted in about 10 seconds. The only thing that passes is a fine single horizontal wire antenna but nothing must be supporting it. The W3EDP seems to be about the only thing that I can use. I experimented extensively with the W3EDP wire antenna. The W3EDP, a variation of a true Zepp, is an interesting antenna, and one that I had high hopes for. 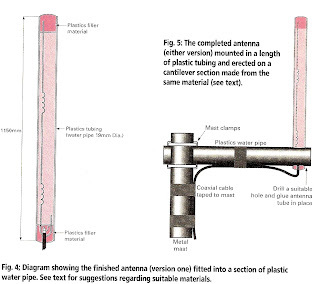 It is described in Practical Wire Antennas by John D. Heys, G3BDQ; additional information on the W3EDP can be found in my Archives and Articles and in the article The FFD Antenna: A Field-Friendly Doublet, with Notes on Related Designs by Charlie Lofgren, W6JJZ. The W3EDP consists of an 85' wire and a 17' wire that's sometimes called a "counterpoise". The counterpoise isn't connected for 80m or for 10m, but is connected for 15m, 20m, and 40m. The W3EDP is very easy to deploy--it needs only one elevated support, doesn't need a separate feedline, and packs up really small. My initial trials of the W3EDP were using the MFJ-901B/HM-9 combination. I was able to successfully use the the W3EDP on 20m and 40m over the year that I experimented with it, on several operating events as well as on two trips away from home. Following the recommendations (article) of Charlie Lofgren, W6JJZ, I tried configuring my W3EDP such that the 17' wire was half of a parallel feedline, using 0.75" x 1.5" sheet styrene pieces as separators. However, when I tried this arrangement as an Inverted-L (using a sliding "button" insulator on the radiating element) from a cabin on Presque Isle, Michigan, I had trouble getting a good match on 20 and 80 meters. On subsequent trials with the 17' counterpoise lying on the ground it tuned easily on 20 and 40 meters, but I couldn't get a match on 80 meters. Clearly, the W3EDP/MFJ-901B antenna system was not the ideal all-band antenna system. The arrival of the LDG Z-11 QRP Autotuner changed everything. The Z-11 easily tunes the W3EDP on 10, 15, 20, 40, and 80m through the homebrew 4:1 balun. I used this antenna from my billet at Rickenbacker Air National Guard Base during the month of June, 2003, suspending the 85' portion of the antenna between my third-floor window and the outside staircase of the neighboring building, allowing the 17' component to hang out the window. The tuner with balun easily tuned the antenna on all bands tried and QSOs were successfully made on 40m. I have also used the W3EDP/Z-11/balun combination in the field. I operated the 2003 E-PA QRP "TAC" Contest with the W3EDP/Z-11 antenna system, this time with the 85' portion extended in an inverted-L arrangement between two trees and the 17' component lying on the ground beneath the radiator. Again, the tuner easily tuned the antenna on all the bands tested and QSOs were successfully made on 20m and 40m despite poor band conditions. 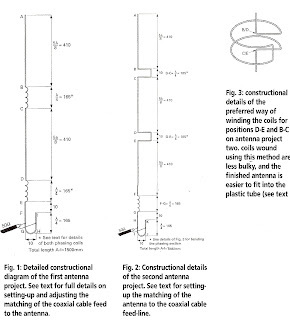 The W3EDP/Z-11 antenna system is a viable all-band antenna system. It's easy to deploy, tunes easily, and covers all the bands of interest. I have 100' of teflon-coated wire wound onto an inexpensive plastic camping-style clothesline reel (photo). My plan with this wire antenna is to spool out as much as the available supports allow and operate it against the 17' W3EDP counterpoise. Just opened post after being away fro few days /P operating (FT817 and MPX-100) from bicycle as cycled from Cambridge to Lincoln. PW was one of the magazines and I noted the transistor tester, I built an M-Cubed semiconductor tester kit bought at FDIM 2008 a while back and this looks interesting so will have a go at building it.